As a business owner or manager, you can be in a situation where you need commercial junk removal services because the job is big to do yourselves. The question you have to ask yourself is "What do you look for in a reliable junk removal service?" It may not be a matter of there being too few choices. In fact, depending on where you place of business is located, it may be a problem of having far too many choices. And after going through any number of websites you might feel that they are all pretty much the same except for the color scheme on their website! And it would be understandable to think that. But the truth is not all junk hauling firms are the same and, when it comes to business-to-business, or commercial, junk hauling you really only want the best. While it is certainly possible to hire just anyone with a truck to come into your place of business and haul away your junk, there is much more to be considered a quick and easy fix. It's unlikely you would hire "just anyone" to install a new server, re-pave the company parking lot, or even provide your coffee service, for example. No, you would vet the available vendors, compare pricing, review any referrals or client reviews, and possibly even interview a few candidates. And there is no reason to not take the same approach to finding and hiring a business junk removal firm. Consider the reasons you might need commercial junk hauling. Perhaps your company has decided to finally clean out all the old furniture, office equipment, broken pallets, old boxes and crates, and other assorted items that have been piling up or being stored. Maybe you're launching off into a major relocation and need to get rid of all that old stuff you no longer want or need instead of moving it to your new location. And it's possible that you've made the investment in remodeling or renovating your offices or work spaces and need to remove all the construction debris and junk that has resulted. Or, if your place of business suffered damage from wildfires, flooding or storms - which seems to have been unusually common the last year or so - you may be just now cleaning up the bulk of the debris and damaged items. Whatever the reason for needing commercial junk hauled away, you want to be certain that the people you allow into your business and work spaces are reliable, competent and professional. 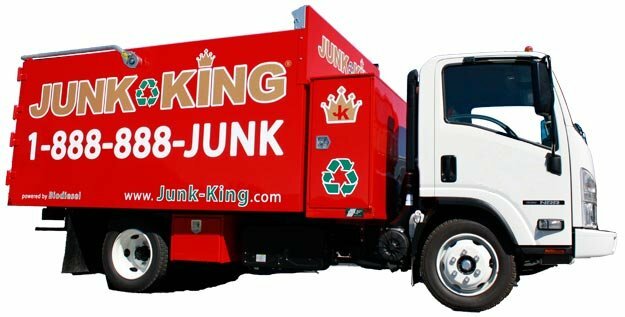 Junk King helps other businesses with a fast, easy solution for their junk removal needs. You can stay focused on what you do best by bringing in the business junk removal experts to haul away the garbage. Top-Rated Service - Junk King promises on-time, reliable services that provide exceptional value for your bottom line. Payment Plans - Business accounts enjoy easy payment plans. And Insured Vendor - Junk King is fully insured, so you and our staff are protected when we perform junk hauling services. Junk King offers business junk removal services that cater to every industry! At Junk King we provide efficient, safe and eco-friendly business junk removal services so you don’t need to worry about the pick up or disposal of those old items. Not only that, but we make sure that your old furniture and electronics end up in the right place: whether it be a charity if the electronics are still functioning, or a recycling facility to ensure your broken down items are disposed of in an eco-friendly way. Large trash items, and more! Ready to remove your business junk? It’s as simple as 1, 2, 3. You can make an appointment by booking online above or by calling 1.888.888.JUNK (5865). Our professional and insured commercial junk removal team will show up at your home or office. We call 15 minutes before we arrive on site and we’ll give you a free estimate based on how much room your junk takes up in our truck. You point and we haul those items into our junk removal trucks, with no hidden fees.